Lieutenant George Washington De Long developed his idea for a North Pole expedition while on an expedition searching for a lost Arctic expedition. Ironically, De Long's North Pole sailing trip required a number of rescue missions of its own and was one of the more tragic of its era. In January 1873, Lt. De Long volunteered to be a ship's officer aboard the USS Juniata that was to search for Polaris of the US North Polar Expedition (1871-1873) under (then deceased) Charles Francis Hall. Juniata did not find Polaris survivors. However, in August, during a perilous search aboard the steam launch Little Juniata lasting several weeks, De Long demonstrated courage, composure, and resolve. He had volunteered to lead the round-trip cruise in the small boat from Upernavik, Greenland, to 75°52' N, just beyond Cape York. It was during his Polaris search that he conceived a plan to reach the North Pole by ship. Adopting erroneous scientific views of the time, De Long hoped to sail up the coast of unexplored "Wrangel Land" (Wrangel Island was thought to be part of an Arctic continent). He expected relatively open water to the North Pole created by the warm Japanese Ocean current, the Kuro Siwa. The US North Polar Expedition ("Jeannette Arctic Expedition") was financially backed by New York Herald publisher James Gordon Bennett. The US Navy supported with crew, outfitting, and instructions. Jeannette was formerly Sir Allen Young's Arctic expedition yacht Pandora (1875, 1876). Besides De Long, there would be Lts. John W. Danenhower, Charles W. Chipp, chief engineer George W. Melville, ice pilot William Dunbar, surgeon James M. Ambler, a meteorologist, naturalist Raymond Lee Newcomb, and 24 men. Some had been with De Long on the Polaris search. The expedition departed from San Francisco on July 8, 1879. A stop was made on August 12 at St Michael for dogs and some other supplies. Sightings by whalers while they were off Alaska were probably the last time Jeannette was seen. As they proceeded through the Bering Strait into the Arctic Ocean, they passed points where Adolf Erik Nordenskiöld's North East Passage expedition (1878-1880) had wintered. 71°35' N 175°40' E. The ship would drift, powerless, for nearly two years. Despite their situation, De Long was calm and confident, credited with keeping his crew healthy and cheerful. Drifting generally northwest, they sighted Wrangel Island on October 28. It was revealed to be an island rather than part of a larger landmass. They began drifting backward from their position of 73°49' N 177°40' E on May 24, 1880. Six months later, they were nearly back where they had been in April. In 1881, they again resumed a northwesterly movement. By February 14, Jeannette was 75° N at about 171° E. Shortly thereafter their depth soundings allowed them to make another discovery. They were over the margin of a deep ocean. It was much farther south toward the Bering Strait than the Arctic Ocean had previously been thought to extend. On May 16,1881, they discovered Jeannette Island. Eight days later they sighted Henrietta Island (both now designated in the De Long Islands). On June 2, a sledging party left Jeannette to explore Henrietta Island. Ten days later the entire crew would leave Jeannette for good, as it was crushed and sank. It would be about 100 days before they reached their hoped-for rescue on the Russian north Siberian coast in the Lena Delta. De Long divided the party equally into two cutters and a whaleboat and headed for the New Siberian Islands. De Long and Dr. Ambler headed one cutter. The other was led by Chipp and Dunbar. Melville and Danenhower superintended the whaleboat. After being forced northwest for a while, all three parties began trekking south over the ice with their boats. Despite an arduous, circuitous path, they finally reached Bennett Island on July 29 at the northerly tip of the De Long Islands. Following a ten-day rest, they boarded their boats for what would be another month before reaching their destination. Remarkably, only minor physical problems bothered the expedition members until they reached what should have been their rescue. Nearing the edge of the Lena Delta, the three boats separated in a storm, never to reunite. One cutter was lost with all aboard. De Long's cutter with 14 men made a landing on September 17, 1881. Two days later, the whaleboat party with Melville landed on the easterly side of the delta. Melville's whaleboat party immediately found inhabitants who took them to the regional capital at Bulun (Yakutia). In the meantime, De Long's group began to die from starvation, exposure, and exhaustion. The leader sent two of its members ahead in the hope of reaching help. They had difficulty being understood when found, but were also finally guided on to Bulun, too late alas to save the rest of their party. Melville met them, and immediately launched a search for the other survivors between November 3 and 27. None of the bodies was found. They had all perished by about October 30, 1881. In the meantime, the United States had begun a search. Alliance under George H. Wadleigh and Rodgers with Robert M. Berry left on June 16, 1881. Earlier, the US Revenue Cutter Thomas Corwin with Calvin Leighton Hooper had a search for Jeannette included in its orders. Newspaperman Bennett dispatched a small overland search party with John P. Jackson. There was an international response, including Leigh Smith in Eira and the Dutch in Willem Barents. Melville found and buried the deceased members of De Long's party, when returning in the spring of 1882 for a final search with a small group of survivors. Twenty had died on a quest that was founded on inaccurate scientific assumptions. It had led to the charting of Lena Delta, some island discoveries, oceanographic findings, and the correct identity of Wrangel Island. Three years later, debris from Jeannette was found washed up half a world away on a Greenland shore. 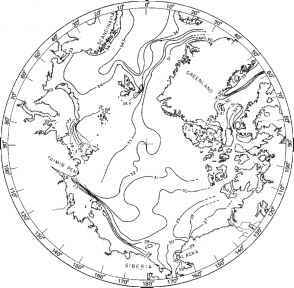 This prompted Nansen's Fram drift expedition (1893-1896) that would confirm an important new understanding about Arctic Ocean currents.